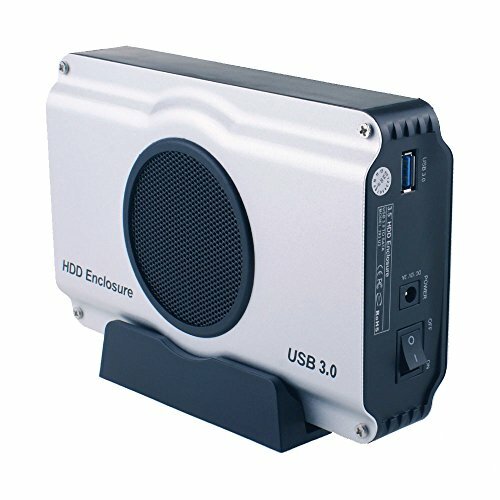 Connect any 3.5″ SATA Desktop Hard Drive externally to your computer through an available USB 3.0 port. Transfer data quickly and easily through USB 3.0 at speeds of up to 5Mbs. The WANLONGXIN enclosure is constructed from durable aluminum, to ensure heat dissipation, protecting your drive from overheating; and large screws make for easy assembly. A perfect solution for data transfers or data backup! 1. Supports Standard Desktop 3.5″ SATA Desktop Hard Drives. 2. Ultra Light Aluminum Case provides heat dissipation, and 80mm Cooling Fan. 4. LED light indicates Power and Activity status. 5. Hot-swappable, plug and play, no drivers needed. 6. Reverse compatible with USB 2.0/1.1.